The president's visit comes two weeks after Maria first struck the island. San Juan Mayor Carmen Yulin Cruz told President Trump Tuesday that hurricane relief efforts in Puerto Rico were "not about politics," just days after Trump sparred with Cruz over the federal government's response to the island. "It’s all about saving lives, it’s not about politics," Cruz said to Trump as they shook hands following a briefing earlier in the day. Trump accused Cruz of “poor leadership” and speculated that "Democrats" told her to "be nasty to Trump" in a barrage of tweets over the weekend after the mayor decried a comment by the Acting Homeland Security Secretary Elaine Duke, who said she thought the federal government's actions in Puerto Rico were "a good news story." It was originally unclear if Trump and Cruz would meet, but on Tuesday morning Cruz announced that she had been invited to the briefing and had accepted the invite. "I will use this opportunity to reiterate the primary message: This is about saving lives, not about politics; this is also about giving the people of Puerto Rico the respect we deserve; and recognizing the moral imperative to do both," Cruz said in a statement prior to the meeting. Trump touted the response to Hurricane Maria as he attended the briefing on relief efforts, noting that the territory's officials "can be proud" of the relatively low death toll on the island compared to Hurricane Katrina in 2005. Noting that "every death is a horror," Trump called Katrina "a real catastrophe" given its "hundreds and hundreds and hundreds of people that died," before asking a Puerto Rican official for their "death count." "Sixteen people certified," Trump noted. "Sixteen people versus in the thousands. You can be very proud of all of your people and all of our people working together. Sixteen versus literally thousands of people. You can be very proud." After the president left San Juan, Puerto Rico Gov. Ricardo Rossello announced the death toll from Maria rose to 34. Cruz characterized the president as having a "lack of sensibility" in an interview with CNN Tuesday afternoon. She later told the network that she felt the most productive part of the meeting was when she met with White House staffers. "I truly believe that they finally saw the connection, or the disconnect, between what they were hearing on the one hand and the reality of what is happening on the ground," the mayor said. But Cruz denounced Trump's visit as a public relations stunt and criticized how he handed out supplies at Calvary Chapel. "His terrible and abominable view of him throwing paper towels and throwing provisions at people, it's really -- it does not embody the spirit of the American nation," Cruz said in an interview with MSNBC Tuesday night. Trump told reporters aboard Air Force One that he heard zero criticism during the visit and described the day as "terrific" and "great." Hurricane Maria carved a path of destruction across Puerto Rico two weeks ago in a storm season that has already seen hurricanes Harvey and Irma create billions of dollars in damage in Texas, Louisiana and Florida. Trump said Tuesday it would be costly to rebuild the island and restore its infrastructure following the storm. 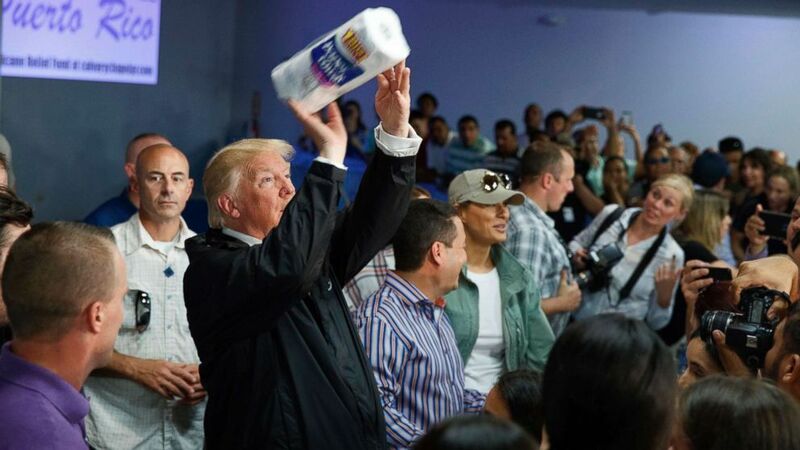 "I hate to tell you, Puerto Rico, but you've thrown our budget a little out of whack," said Trump, "because we've spent a lot of money on Puerto Rico and that's fine. We saved a lot of lives." 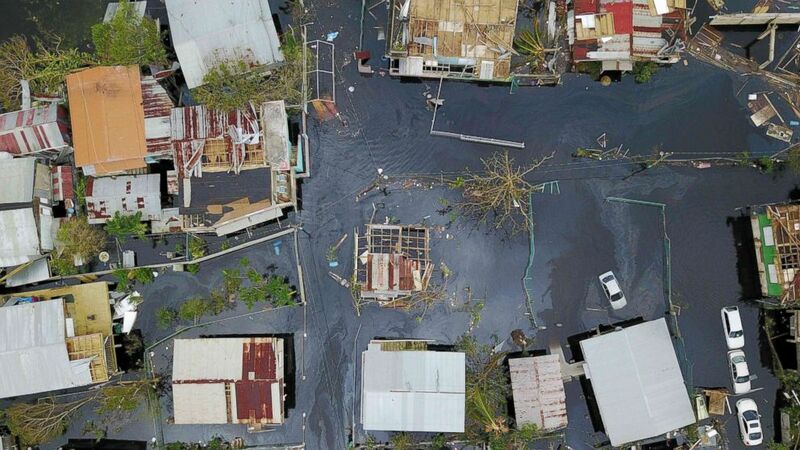 (AFP/Getty Images) An aerial view shows the flooded neighbourhood of Juana Matos in the aftermath of Hurricane Maria in Catano, Puerto Rico, Sept. 22, 2017. The president has repeatedly defended the federal response to Puerto Rico despite facing severe criticism. “It’s been amazing what’s been done in a very short period of time on Puerto Rico,” the president said in the Oval Office Monday. The island is still grappling with the damage caused by Hurricane Maria. Only 47 percent of the island’s water customers have access to potable water and 95 percent of Puerto Rico is still without power, according to officials.